Music is a universal language. People can enjoy melodies no matter where they come from. This fact inspired Turkish Ambassador Zekeriya Akcam to invite two Turkish groups to perform in Jakarta. The groups were Allegra and Gul Isigi. Allegra represents modern Turkish music, Gul Isigi the traditional. “These musicians are the best of the best in my country. We will be entertained by high quality Turkish music in Jakarta,” the ambassador told The Jakarta Post at the concert at Usmar Ismail Hall in Kuningan, Jakarta, on Thursday night. The performance began with Allegra singing Indonesia’s national anthem, “Indonesia Raya”, and Turkey’s national anthem, “Independence Hymn”. The music featured piano, violin, flute and violoncello. The beautiful voice of Allegra's soloist Mehlika Karadeniz mixed with the perfect sound of the musical instruments to create harmonics enjoyed by the audience of comprising ambassadors, businessmen, foreigners and Indonesian artists. 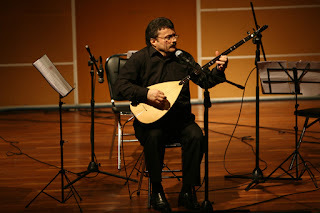 Gul Isigi took the stage after Allegra, performing traditional Turkish music with a zither, frame drum, reed flute and oud (a pear-shape stringed instrument). They played 15 maqams (a style of singing with music), representing Makam Segah, Ussak, Muhayyer Kurdi and Nihavend. There have actually been 500 maqams composed in Turkey. Today as many as 50 maqams are still used, creating the forms and tastes of Turkish music. Turkish classical music is complicated for music loving beginners. The music uses both micro and macro tones and each maqam has its own style and scale. Gul Isigi performed the Ilahi, which is a hymn to show love for Allah and the Prophet Muhammad. The Ilahi had been arranged in several maqams. There is no difference between Ilahi, songs and musical instruments in terms of maqam. The difference is only the style and staging. During the performance, Gul Isigi presented the history of Turkish music from the 18th century to today. The next performance was a solo folk music performance with a baglama. The Baglama is a stringed musical instrument. Like an oud, a baglama has a deep round back but a much longer neck. Allegra then performed 12 folk songs from Turkey. Just like Indonesia, Turkey has many folk songs that are still popular today. One of the folk songs was “Magusa Port” from the Cyprus area. The song tells of a man named Arap Ali who worked at the Limasal Port. In 1943, Arap Ali went to the Magusa Port to load his goods. He visited a bar there and was involved in a fight with a British soldier. He was killed and the song was composed. The performances of these two groups of musicians created different points of view in terms of Turkish music. “The zither makes the Turkish music different and I like the sound of that instrument, it is so unique,” Diah, an audience member, said. Allegra was founded as the Allegra String Quartet in 2005. The group is comprised of seven women, and was established to perform the musical heritage of Turkey and to consider the universality of music. Gul Isigi perform Turkish classical and Sufi compositions of the finest quality. The members of the group are from the academic world, and teach and research the history of Turkish music. Turkish Ambassador Zekeriya Akcam said this was the first performance of Turkish musicians in Indonesia. He plans to invite more musicians to perform in the country in order to introduce Turkey to Indonesia. “We plan to hold a concert in May or June. I would like to discover what kind of music they like and then we can perform maybe in Surabaya, Jakarta or Bandung,” he said. “The performance today is a test case to see whether people in Indonesia like Turkish music,” the ambassador added. In the future, it will be possible to invite Indonesian musicians to Turkey to perform. “Actually we share many similarities. Turkey also has a kind of music similar to dangdut in Indonesia,” Akcam said with a big smile. He added that the money earned from the recent show will be donated to the Rehabilitation of Disabled Children Foundation (YPAC). Purti Muki, the chairwoman of YPAC, confirmed the donation. She said she was pleased with the generosity of the Turkish Embassy, as YPAC needed funds.